On Saturday the Urban Sketchers Sydney group gathered at Town Hall. Sydney Town Hall is one of Australia's finest examples of French Second Empire architecture. Designed by architect J H Willson in 1868, it is said to be inspired by Hotel de Ville in Paris. In anticipation of Paul Wang and Liz Steels' expressive sketching workshop in March, I tried a loose watercolour sketch with some parts wet on wet, others wet on dry. 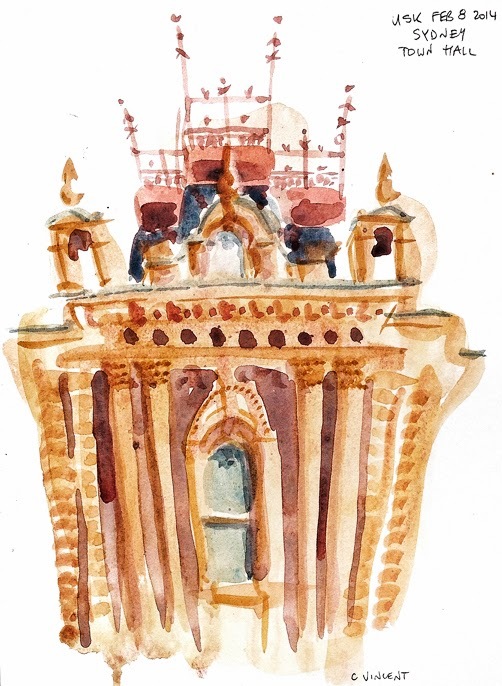 The iron work at the top was too pretty to not attempt with more detail, so in between layers drying, I made a second sketch of the top with a new Hero pen Liz picked up on her Penang/Singapore trip. I love the varied lines from this bent nib pen. They lend themselves well to the intricate forms. 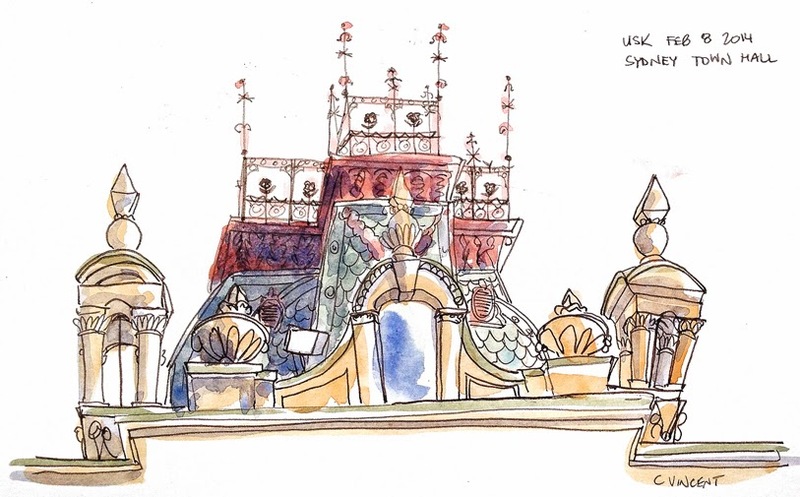 This separate sketch was also helpful to determine what features to add in the watercolour only sketch. If you are travelling to Sydney to sketch, this area offers more grand buildings nearby such as St Andrews Cathedral and the Queen Victoria Building. The difficulty is in choosing what to leave out.